It’s almost exactly 14 years since I first addressed the Orewa Rotary Club, and almost exactly 13 years since I came here as Leader of the National Party to give a speech which, for a time, turned “Orewa” from a place to a date, so that people spoke of “before Orewa” or “after Orewa”, rather than north of Orewa or south of Orewa! An odd thing happened after I spoke here 13 years ago. As soon as I’d finished, the pundits pounced. As pundits do. They know more than us, don’t they? And they certainly knew what my speech would mean. They said I’d lost the plot. They said National’s ratings would plunge. They said it would be a disaster for the party. And of course they were absolutely… wrong. National’s poll ratings shot up: one of the biggest jumps ever. Eighteen months later, in the 2005 election, we almost became the government. As it was, we won 21 more seats than we had had in 2002. Our party vote was the highest in any election since 1990 and 18% higher than it had been in 2002. I believe my speech here triggered that amazing jump in support. I believe the people – not the pundits – knew what I was saying. They knew that it was not – and never will be – racist to call for equality. They knew what they wanted New Zealand to stand for: A fair go, a fair deal. For everyone. Not favouritism for some. And definitely not favouritism based on race. They wanted New Zealand to be a country where everyone shared the same air – which is the meaning of the hongi – the same rights, and the same opportunities. The people knew then – and they know now – that all racism is racist, no matter which race benefits. And they didn’t want a bar of it! Not then. Not now. But, 13 years on, racism still rules the roost. The push for privilege persists and our politicians still pander to it. Inch by inch, step by step they have created islands of influence, and positions of power…for one race only. Make no mistake, our Parliament has done this, our politicians. They’ve been busy passing racist laws while dishonestly branding other people ‘racist’, using a lie to replace logic. They call the people who disagree with them a fringe. Well, we’re not a fringe. We’re a throng. They label me a lone voice attacking the Treaty. But I’m not. The Treaty is a wonderful stick for activists to beat the rest of us with…It’s been the basis of a self-perpetuating industry in academic and legal circles. As our increasingly dismal national day continues to show, the Treaty is no basis for nationhood. It doesn’t express the fundamental rights and responsibilities of citizenship, and it doesn’t have any unifying concept. The Treaty itself contains no principles which can usefully guide government or courts. It is a bald agreement, anchored in its time and place, and the public interest in it is the same as the public interest in enforcing any properly-made agreement. To go further than that is to acknowledge the existence of undemocratic forms of rights, entitlements, or sovereignty. Then, in 2002, Bill English, as Leader of the National Party, discussed the Treaty in a speech at the New Zealand Centre for Public Law and noted that Hobson and the missionaries took great pains to explain to Maori the decision they had to make, and the kind of sovereignty and order the British would create. Maori were prepared to cede their sovereignty because of the anticipated benefits of a common, non-segregated polity in New Zealand. The solution to the challenges that the Treaty presents to all New Zealanders lies in a single standard of citizenship for all. What’s happened since those speeches were made? In May 2003, Bill English committed a future National Government to the abolition of separate Maori electorates, as the 1980s Royal Commission on the Electoral System had recommended if MMP was adopted. In 2005, believing that historical grievances would damage race relations in New Zealand if they dragged on endlessly and weren’t resolved, I committed a future National Government to resolving these grievances within six years, and also pledged to scrap Maori electorates. John Key made similar commitments in 2008. Tragically, we’ve been moving in exactly the wrong direction ever since. • The National Government has certainly sped up the resolution of historical grievances but the process still drags on, and too often involves granting not just financial redress but also so-called “co-governance”, giving unelected tribal appointees the right to have a decision-making role in local government. • Maori electorates – created for just five years in 1867 to give all Maori men the vote, whether they owned property or not – are still with us 150 years later. The Government has quietly abandoned any suggestion they will be scrapped, and a Labour MP has a Bill in the Members’ ballot which would, if drawn and passed, “entrench” Maori electorates. And this despite the fact that the need for Maori electorates to ensure Maori voices are heard in Parliament has long gone, with more than 20 MPs now identifying as Maori. • A Bill to amend the RMA now wending its way through Parliament would, if passed in its present form, require all local authorities, within 30 days of an election, to invite their local tribes into “iwi participation agreements”, which would entrench co-governance on a grand scale. • The legislation setting up the Auckland super-city said there had to be an Independent Maori Statutory Board, made up of unelected appointees, and Auckland Council chose to give the members of this unelected Board voting rights on most Council committees. • For several years now, the Government has been talking behind closed doors with tribal leaders about how to give them a special right, based only on tribal affiliation, to influence how fresh water is allocated, despite the Government’s long-held contention that “nobody owns water” and despite decisions about the allocation of water being traditionally the exclusive right of elected local councils. • In recent months, discussions have been going on, almost entirely below the radar, which are likely to lead to half of the members of the Hauraki Gulf Forum being tribal appointees. This body has potentially far-reaching powers covering the sea area of the Hauraki Gulf and all of the extensive land catchments around it. • Last year, we saw the Maori king expressing the hope that by 2025 Maori would be able to “share sovereignty” in New Zealand, and nobody pointed out to him that all Maori already “share sovereignty” because all Maori adults have a vote. But I suspect that wasn’t what he had in mind. I suspect he was continuing the myth that Maori chiefs did not cede sovereignty when they signed the Treaty, despite overwhelming evidence that they did do so, and understood that was what they were doing, as Sir Apirana Ngata insisted in 1922 when he wrote “The Treaty of Waitangi, An Explanation”. • Very recently, we’ve seen Labour and the Greens saying they would make it compulsory to learn te Reo in all schools, even though I believe that learning to read and write good English would have much greater practical value for all children, including Maori children. And that’s not just because English is spoken by the vast majority of New Zealanders, but also because it is the only genuinely international language – the language in which most scientific articles are written, the language in which most international commerce is conducted and the language of international aviation. • Increasingly, we see unfounded claims that the Treaty involved some kind of partnership between the Maori people and the Queen, and we see this idea of partnership particularly being promoted in the education and health sectors. Indeed, endorsing this partnership idea seems to be essential for any kind of leadership appointment in the government sector. But as Winston Peters said in a speech in Paihia earlier this month: If no-one in the British Empire was in partnership with Queen Victoria on the 5th February 1840, how come the New Zealand Maori was one day later? • Last, and by all means least, the newly formed Opportunity Party is so confused by this imagined partnership that it wants to create an Upper House of Parliament, with half its members being Maori. As I said earlier, those of us who say these developments are totally inconsistent with any reasonable interpretation of the Treaty or the meaning of democracy are routinely abused as racists, even though what we are advocating is not only not racist it is in fact the exact opposite! We’re saying that all racism is racist. We’re saying that no one race should have any kind of constitutional preference. We want New Zealand to be a country where every citizen, of every colour and creed, has the same political rights, no matter when they or their ancestors came to the land we share and the country we are building together. To call that racist is the epitome of Orwellian double-speak. It is important to stress that we are not arguing that Maori are “privileged” in any economic sense. While a few Maori are among the wealthiest in the land, average Maori incomes are well below the average for other New Zealanders. And of course because of that, Maori New Zealanders rightly receive a larger share of government social welfare and education budgets. Most government spending is rightly geared to need, and not to ethnicity. But we say that giving constitutional preferences to those with a Maori ancestor – along with ancestors of many other ethnicities too – is leading us down the road to racial conflict. And who benefits from these unprincipled constitutional preferences? Assuredly not most Maori. They gain absolutely nothing from such preferences, which overwhelming benefit only the Maori and Pakeha elite. It is that elite who get the big directors’ fees, and the fees paid when consulting with Maori is a legal requirement. It is the same elite who get to play with the millions handed out in Treaty settlements, not Maori truck drivers or freezing workers or builders or the thousands of others in the work force. Those of us behind the Hobson’s Pledge Trust share the view of great leaders like Sir Apirana and Governor Hobson that New Zealanders became one people when the Treaty was signed. I have a dream that my children will one day live in a nation where they will not be judged by the colour of their skin but by the content of their character. “…Judged not by the colour of their skin but by the content of their character.” That’s our goal. And I believe it is at the heart of who we are and what we want New Zealand to be. Those who built this country were determined to put rank and status and privilege behind them. They wanted this to be a land of equals, an egalitarian land where your choices and your chances didn’t depend on class or colour but on character. Yes, we’ve failed sometimes, I acknowledge that. But let’s not fail again. We cannot abolish privilege by creating privilege. By agreeing to do so, our politicians are creating a new injustice and poisoning our future. I say the racism of our elite has done its dash and had its day. We have a duty to our history and to the best dreams of our ancestors to stand for equality and demand a fair say, a shared say, with no privilege granted on the basis of race. If you share that vision, join Hobson’s Pledge and help us spread the word. Especially this year, when you can tell your Member of Parliament, and anybody standing for election to Parliament, that you want New Zealand to be, as Martin Luther King said, a place where every citizen, irrespective of the colour of their skin, is treated as an equal. Ask anybody seeking your vote: Which do you support? A single standard of citizenship or race-based rights for some? If they won’t answer you or say they support race-based rights, then tell them they will not get your vote. Speech by the Rt. Hon. Winston Peters “The Treaty of Waitangi as it was and should be,” Paihia, 3 February 2017. The left, for whatever reason, will still say that calling for equality is racist! Brian Edwards after the original Orewa speech said that it was the ‘subtext of racism’ that was wrong – implying that it wasn’t what Don Brash said but what he meant to say which was somehow different. Tells you more, much more about the critics than about what Don says. Not hard in all this to see who the true racists are. One day we will surely wake up from this nightmare-but not under this government nor under a labour/Greens government which will just make the whole situation much, much worse. Well said Noel as soon as the truth is let out the better for our country. We are apartheid/racist country put in place by our white leaders, and governments like National, Labour and the Greens and the people who vote for them. 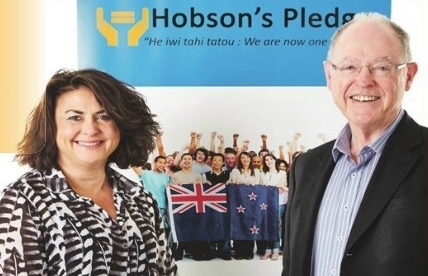 There is no direct connection between 1Law4All and Hobson’s Pledge. Yes – the Hobson’s Pledge folks are well aware of the existence of 1Law4All. The future is fraught. 1Law4All needs an appropriate Party Leader, first and foremost. Perhaps that’s seen as a poisoned chalice, too? It would not be an easy task – yet it must be done by someone. Winston says all the right things and has done so for some time. But when it comes to action and making good on things said / promised, Winston’s Party is nowhere to be heard. NZ First has been milking votes off liberal indig-‘two’-nations ignorant bliss two cut and tuck FFP parties since the beginning of his career. GOD SPEED for 1law4all as it faces liberal indignations resistance of false pretences.